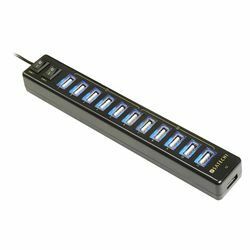 Add twelve additional USB 2.0 ports to your computer with this slim strip-shaped USB 2.0 hub. The hub is designed so that the two switches can activate the first six or second six USB ports.Blue LED indicators show which bank is active. 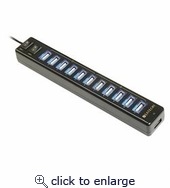 Equipped with an optional power supply, Satechi's 12-port hub provides stable current and effective operation of connected USB devices. Includes AC adapter and 3ft USB extension cable. Requires Microsoft Windows, Mac OS 9.1+ or Linux 2.4+.